The merits of putting baby on his belly. With feedings, dirty diaper changes, getting babies dressed and soothing their discomforts, parents are busy people. But what some parents fear, or might forget about, is giving their newborns tummy time. Tummy time is significant for many reasons. It helps children gain head control, spinal musculature, arm strength and sensory skills. 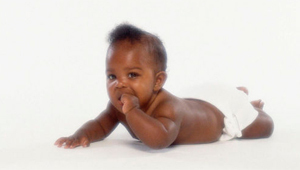 Tummy time is important for achieving many of the developmental milestones that are expected in a child’s first few months, and it reduces the chance of sudden infant death syndrome (SIDS). In order to have refined control of our hands, we must have good control of the larger muscle groups, including our torso and shoulders. This is evident in typical development when a child is only able to swat without graded movements before he can successfully swat or grasp in a supported sitting position or while on his back. Once children are able to sit unsupported, their reaching and grasping tend to be close to the body. As their postural control improves, they are able to grasp and maneuver toys further from their bodies. Before you know it, infants are able to pick up the tiniest object off of the floor. However, if a child has poor postural control and delayed fine motor abilities, you should still address shoulder, arm and hand strength. Use tummy time to help increase postural control and build all of those muscles early on in your baby’s life. Tummy time enables a child to develop shoulder and arm strength, which later becomes the foundation for crawling and fine motor manipulation, including handwriting. A child with weak shoulders will have weak wrists and fingers, making handwriting challenging and fatiguing. Always supervise your newborn, especially during tummy time. As time progresses, you will see that your child will be able to tolerate more tummy time activities with better control. You’ll soon observe that your baby will begin to push up on his forearms. To modify the activity, place your child over a small boppy or your leg to promote bearing weight through his arms. Some babies detest being on their tummies. But resist stopping the activity. Rather, judge what you and your infant can tolerate. Place toys in front of your child to capture his attention and keep him motivated to be on his belly. As children get stronger, they start to grasp and manipulate toys on their tummies. Your baby will then be able to push up on all fours and play in this position. They may crawl. However, some babies bypass crawling altogether and go straight to walking. Crawling is an overall strengthening exercise and helps build arm strength. For babies who do not crawl, emphasize playing on all fours. Lay your baby over your leg to encourage him to bear weight on one arm and reach for a toy with the other. Stuff a tunnel with pillows and have your child crawl over them. Also try wheelbarrow walking. Wheelbarrow walking is exactly what it sounds like. Have your child bear weight on both arms and support him on his pelvis, removing the lower body off the floor. The goal is for the child to walk on his arms. You may have to guide your child by moving his arms for him the first few times while attempting wheelbarrow walking. Once your child has the idea, you can lower your support to your child’s thighs and then just above his ankles. The further away your hands are from the child’s torso, the harder it is to for the child to wheelbarrow walk. For weaker children, you may have to support them higher up on their torsos. This is a fun activity that you can do with kids as they get older. You can set up a game, like placing a nearly complete puzzle at one end of the room and the remaining puzzle pieces at the other end. Wheelbarrow walk the child to the puzzle pieces, have the child retrieve a piece and place it in his pocket, or you can hold it while the child wheelbarrow walks to the puzzle to place it in the correct spot. Be creative. You can do this a million ways, and you can make accomplishing the game more challenging by having a child wheelbarrow over pillows or couch cushions. All of these activities assist your child in developing strong shoulder, arm, wrist and hand muscles to enable successful fine motor manipulation, including handwriting. Help your child get ready for school by starting early. Place children on their tummies on a ball. Have them walk off by using their arms while you hold their feet. Encourage children to walk on all fours like an animal. Have children lie over a ball, putting weight on one arm while doing an activity on the floor with the other. Roll out a big piece of paper on the floor and have children lie on their tummies to color or paint. Ask children to reach up for toys. Have children push toy cars while on their hands and knees. Encourage kids to color, paint and place magnets and stickers on an easel. You can even draw a road on a piece of paper before placing it on the easel for kids to move their toy cars along the road. If you don’t have an easel, use your refrigerator. Give kids a paintbrush and water, enabling them to help you paint your fence outside. Entrust kids with removable markers that can be used on the windows in a particular room. Tape a piece of paper under a child-size table. Prompt kids to lie on their backs to draw in this position. Melissa Silvestro, OTR/L, is a pediatric occupational therapist with The Therapy Center for Children, LLC, in Patchogue, New York. She is registered and licensed to practice occupational therapy in New York State.